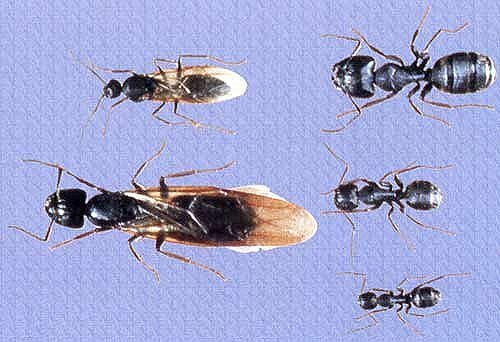 The most common ant in the Bridgewater Ma area which causes home owners to seek professional ant control help is the Carpenter Ant (Camponotus spp.) They are the most noticeable of ants in and around our Bridgewater MA homes. Carpenter ants are large blackish ants with some faintly colored grayish bands on their abdomen. Other carpenter ants may have some reddish or purplish coloration to the thorax (middle body part). Foraging workers have large mandibles which can give a powerful bite. They vary greatly in size, depending on their function, from 1/4 to 1/2 inch (minor workers), 1/2 to 3/4 inch major workers and 3/4 to 1 inch long winged reproductives. Most carpenter ants seen inside your home are the wingless minor workers that make up most of the colony. They are black medium sized ants. Carpenter ants can cause serious damage to wood by excavating galleries, which somewhat resembles the work of termites but can be distinguished by their very clean sandpapered appearance. Sawdust or wood shavings known as frass found in and around the home is usually an indication of a nest being excavated nearby, but very often it goes unnoticed because the wood shavings are being deposited inside your walls. Carpenter ants do not eat wood, but they rip it apart with their front mandibles for nesting. Moisture is a desirable condition for ant colonies, and wood which has been water damaged is a prime target for new nests, although perfectly dry and sound wood is also excavated. Galleries are cut with the wood grain and major workers then carry the developing larvae from the outside nest ( around 30,000 ants) to the new satellite colonies in nearby homes. These secondary nests can have up to 3,000 workers. 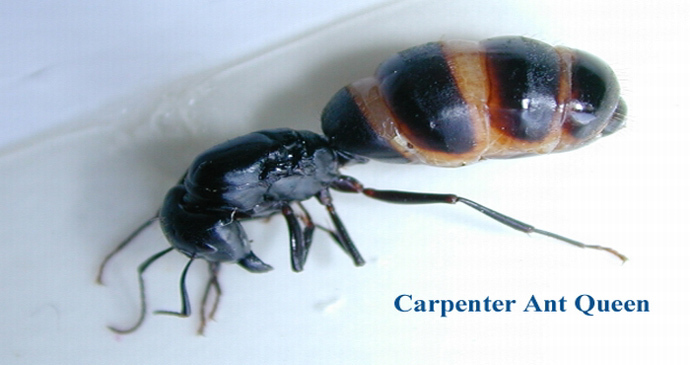 We use a low toxicity odorless treatment to prevent or eliminate carpenter ant infestations. Our treatment not only eliminates the carpenter ants you are seeing, it also eliminates the hidden carpenter ant nests in your walls. This is where the real damage is occuring. Note: To prevent a re-infestation, a carpenter ant treatment should be done on an annual basis before May 20th. After the middle of May, homes that are located within the 300ft. range of an outside carpenter ant colony might already be re-infested. This is because the carpenter ant workers might have already hollowed out some new wood in your home to move the newly developing larvae into. Besides individual carpenter ant treatments, we offer annual service plans that schedule their spring-time preventative treatments before this important date. The most susceptible areas of your home to carpenter ant damage are where decks connect to your home, window sills, corner exterior sections and under any doorways. They can however be found almost anywhere in the house. Once inside the home, ants can quickly travel along water pipes and create satellite colonies in walls and upper levels going undetected until the nest reaches maturity. When this happens, not only is wood being destroyed, but on the first warm day in spring, the nest blossoms and hundreds of ants can come pouring out into your home, prompting a frantic phone call for HELP to someone like Security Pest Elimination! Regularly seeing carpenter ants in your home is a good indication that there is a nest somewhere in the wood structure and carpenter ant damage is happening nearby. Seeing winged swarmers is a definite sign of a nest because carpenter ant swarmers do not forage for food, but leave a mature nest only to mate and start a new colony. If you live within 300 feet of an outside carpenter ant nest your home will be under siege on an annual basis from these ants. They will move their developing larvae every year from the main nest into your home. To prevent them from doing this your home needs to be treated every year. This way the first round of scouts will die and the colony will not select your home for a satelite colony that year. Timely annual Preventative Treatments are a must if you wish to protect your home from carpenter ant damage. Carpenter Ant Queens can live for over 20 years. When she gets too old, the colony just selects one of the other large female reproductives to become the new queen. Most of the eggs in a carpenter ant colony are laid by the many female reproductives. Individually though, the queen being the largest, lays the most eggs. Note: The carpenter ant queen lives outside in a tree. 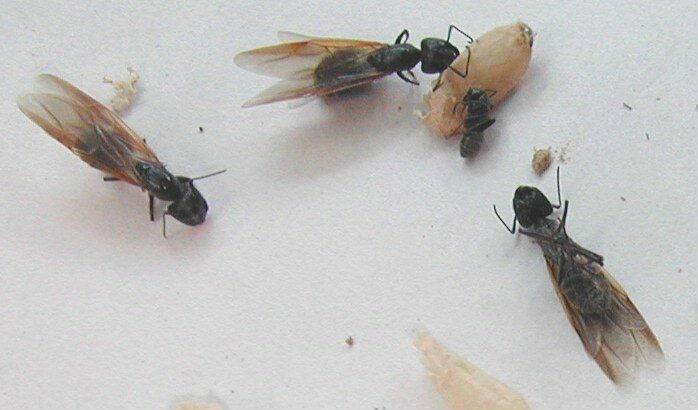 When you find a very large winged carpenter ant inside your home it is not the queen, it is just one of many large female reproductives that have just swarmed from a nearby carpenter ant sattelite colony (most likely from a nearby window, wall or sill area). Sugar ants are light to dark brown with a reddish tint. 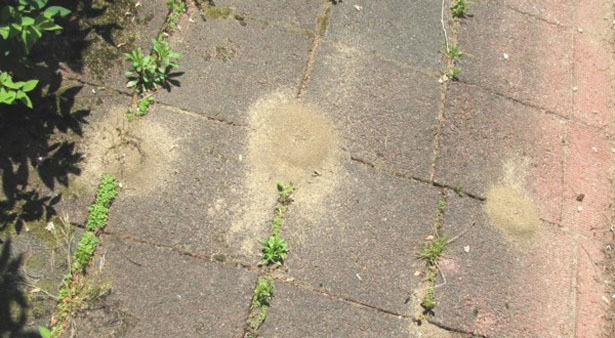 They are the same ants as the ones above we’ve referred to as pavement ants. Appendages are usually lighter than the rest of the body. The size of the sugar ants within a colony will be very consistent averaging one-tenth of an inch, although the winged reproductives can be much larger. Sugar ants prefer sandy soil and usually live underground, but nests can also be found indoors in walls and under floors. Sugar ant colonies commonly number around 500,000 and can be a tremendous nuisance, invading buildings throughout the year, foraging for food. All it takes is for one sugar ant to find a piece of food, and in a short amount of time, the area will be covered by sugar ants. They accomplish this by laying down a pheromone trail from the food source to the colony. The sugar ants underground in the colony simply follow the chemical (pheromone) trail back to the food source. Sugar ants will feed on many things, but prefer greasy and or sweet foods. This attraction for sweets, has led pavement ants ( name used in the pest control trade), to be referred to as sugar ants by most homeowners. Sugar ants can be a particular nuisance in and around homes with slab-on-grade construction and any basement dwellings. Sugar ants are frequently seen trailing up the exterior foundations of homes. Also, since sugar ants live underground, entry into a home can even be obtained through hairline cracks in the foundation or basement floor, even in the middle of winter! We offer safe & 100% guaranteed ant control & exterminator services. Do You See Mold in your Basement or Attic Ceiling? We service the entire Eastern MA and Southern NH Areas. Don't see your town listed? Please call to see if we service that area.